Say 'hello' to a deep drenching of quenching hydration. 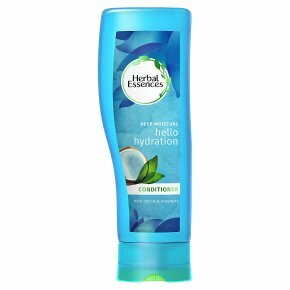 Herbal Essences Hello Hydration Conditioner is a formula with the fragrance of Hawaiian coconut and orchid flower that restores moisture to dry hair. This isn't just a special blend, it's soak-sational. Talk about beautifully moisturised locks. The Hello Hydration Collection: May you dive into a deep ocean of hydration and shine with the rich Hello Hydration collection containing Hawaiian coconut & orchid extracts. Immerse yourself and replenish your hair's much needed moisture. If you're after deep shine, it's hydrating time. It'll quench your thirst for dry / damaged hair in 3 ways: 1- Moisturising Shampoo / 2- Moisturising Conditioner / 3- Deep nourishment & Shine intensive Mask. Say 'hello' to a deep drenching of quenching hydration. Moitsturising Conditioner for dry and damaged hai. Enjoy creamy Coconut essences. Infused Fragrances Nature Inspired.Say 'hello' to a deep drenching of quenching hydration. Herbal Essences Hello Hydration Shampoo and Conditioner have a formula with the fragrance of Hawaiian coconut that restores moisture to dry hair. This isn?t just a special blend, it?s soak-sational! Talk about beautifully moisturised locks. Use with Herbal Essences Hello Hydration Shampoo. Simply apply conditioner generously to wet hair from root to tip, enjoy the scent, and rinse. For more beautiful hair, use with Herbal Essences Hello Hydration Shampoo.